Have you ever wondered what consists of being an influencer in Montreal? We definitely have! That's why the Frenzr team decided to venture out, find popular Montreal influencers and ask them questions about their lives as well as ask them for some tips and trick for those of YOU would like to be in the influencer game. Nowadays, Instagram has become a hub for marketing amongst international and local brands which is how the term influencer (in the Instagram sense) has come about! For those of you who aren't completely sure what an influencer is, don't worry we'll give you a breakdown. According to Dictionary.com, an influencer is "a person or thing that influences" or in the digital age is "a person who has the power to influence many people, as through social media or traditional media". Influencers are found EVERYWHERE, but we decided we wanted to focus on the Montreal market of Influencers. It isn't quite as big as say the influencer pool in New York City, but boy do they pack a punch! Before we get down to business, let us introduce the lovely ladies who will be giving us the scoop. Firstly we have Sonia Zarbatany who is the owner of Vince Camuto Canada, Sanctuary Clothing Canada, and Zarby International. Her Instagram currently has 17.5K followers and she describes her brand image as "one of a working mom, in the fashion industry, constantly traveling, constantly on the go and balancing [her] family, social life, speaking engagement[s] and a fit lifestyle. The brand is clean, positive, inspirational..."
Second, we have Zineb, also known online as Bibouzi who currently has 23.5K followers. She is the owner of Bibouzi Boutique and describes her brand image as "a friend from who we draw inspiration, ask for advice and to whom we are close." She tells us that she always wanted to start a blog, " [she] started this journey by sharing pictures of [her] outfits and [her] culinary adventures, and by seeing people's interest grow day after day, it motivated [her] to offer them more content." Quand on se permet des écarts dans son alimentation, il faut au moins que ça en vaille la peine. C'était le cas le weekend dernier quand j'ai succombé à ces petits bouchées cheesecake aux pistaches et roses de @littleleahskitchen . Un pur délice ! 📸 @tsikimamy_photographie Cheat treat anyone? we must at least make it worthwhile. It was the case last weekend when I succumbed to these little cheesecake pistachios and roses of @littleleahskitchen. A pure delight! Lastly, we have Julie Etienne who's also known as Mademoiselle Jules with an online reach of 14.2k followers. She describes her Instagram and her blog as "a lifestyle blog comprised of all of [her] passions; fashion, health, beauty, food, and travel." The concept for her blog and Instagram stemmed from her two kids. She knew she couldn't go back to pulling 60 hour corporate work weeks, so she decided to "work towards building something that would help [her] explore all of [her] passions" whilst keeping a good work to family life ratio. Now, on to what we've been waiting for, the questions! Q: Why do you think you and your page have become so popular amongst your following? 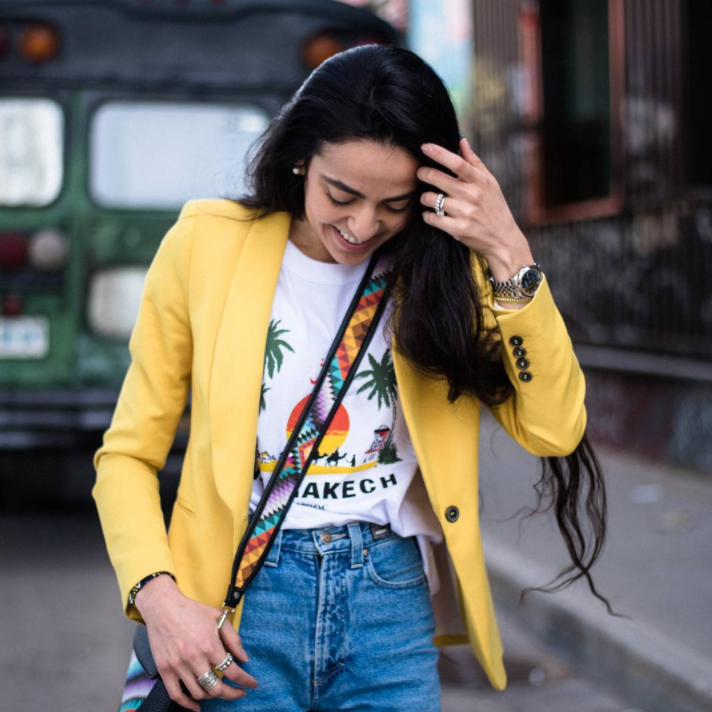 Sonia: "I truly feel blessed with the avalanche of [messages] I get when I share tips on my IG stories, I get approached by brands every day at least a few times a day. I try not to over think about why I continue to grow my following and just stay on course with what is authentic to me, what I love and just feel grateful that so many women can relate and chose to follow me and engage with me." Zineb: "people tell me often that they love my authenticity. They can easily relate to me and to my lifestyle and that makes me happy to hear that. I don't aim at projecting any other image but the one that reflects who I truly am. In fact, when I get contacted by various brands and companies, I stay true to myself regarding the places I promote, the products I review and the companies I associate myself with." Julie: "I think that my momentum has been steadily building because of my commitment to delivering high-quality images and original content that is honest and real. I get approached to promote businesses multiple times per week and I often have to decline products if I don't feel that they are a good fit for me or if my readers/followers cannot benefit from them. I will not compromise my integrity." Q: Who have you worked with in Montreal and what do you like about the Montreal influencer market? Do you find it different compared to other large cities or are all of the markets rather similar? Sonia: "For me, it’s a little different as I am on both sides of the fence. As Exec VP of my fashion brands, we hire and work with influencers and bloggers constantly so I know and have worked with so many of them across Canada. As an influencer myself, I get approached by brands to promote and work with them on different collaborations. What I love about Montreal influencers is we are such a small market, we all know each other and for me, there is nothing I love more than to support my fellow friends and watch them succeed. The pie is big enough for all of us so if I can refer a brand to someone I love and think is great, I am the first one to do so... #womenwhohelpwomen"
Zineb: "I am happy to see that things are moving along through the hard work of other influencers. Nevertheless, brands usually approach Montreal in a different way probably since the market is very small. The comparison is hard to assess since the Montréal market is very different from others. For example, the importance given to fashion is certainly not of the same magnitude than that of New York." Julie: "In Montreal, I have worked with multiple PR agents. We have a rather small market in comparison to some of the major cities in North America but the sense of community and camaraderie among influencers is quite amazing." Q: Do you have any advice for brands who would like to work with influencers and vice versa? Sonia: "Do your due diligence!! Meet the person, make sure the influencer is on brand with your product and will be the right ambassador for your brand. Ask the demographic of their followers and make sure it fits with your target market. My advice to influencers is it is better to have a few key partnerships with brands where you will both grow and develop together then every day promoting another product, brand or service and to lose the trust of your followers. Be honest, be authentic, be you.. and that is always good enough!" Zineb: "I think that, nowadays, we should pay more attention to the personality of the influencer than to the number of likes or followers they have (not saying that we should completely neglect that). Many of you know that likes and followers are often purchased than earned, it became a very common practice in our business. For influencers, I think that what's more important is to collaborate with brands that you can relate with naturally." Julie: "I would say that it's important that you find ambassadorships and partners that benefit your readers/followers and never sell-out if you want to stick around, it's not worth it!" Q: What's the best thing that happened to you from social media? Sonia: "The best thing has been the people I met. The women who reach out and share their stories and those who I have had the opportunity to help along the way. Social media gives us access to incredible and inspiring people who share similar journeys and being able to meet virtually or in person has been such a gift. Partnerships and collaboration with other influencers, mothers, and business owners as well as brands I love have been incredible." Zineb: "Thanks to the social networks, I met a lot of people. People who have become my friends, people I talk to every day. I also find that it creates a community that helps each other. As much as I enjoy telling my stories to people who follow me, I also love listening to theirs. " Julie: "I would say that the best thing that has happened to me since I started my blog was being invited to attend NY Fashion Week. This goal has always been on my bucket list and an important step for me. Not all bloggers receive this coveted invite despite having a huge following. I learned that being an influencer is really not about my number of followers, as I have far less than others out there, and more about my commitment to my brand, about my content and my message." We hope that you have enjoyed this little Q&A as much we did! From the answers we've received it seems to be that the bottom line of being an influencer is to always be your true authentic self and to work with brands that you like and that you think your followers will like. While being an influencer has many perks, it also requires a lot of hard work, putting yourself out there and having the discipline to keep evolving with your content. Join our newsletter & receive our exclusive 30 Days Content Challenge + our favorite social media tips! Sign up below & get all the goodies! Thank you! Now head over to your e-mail to confirm your subscription and receive your goodies! Newer PostStressed over creating social media posts?